122 Degrees Fahrenheit is the necessary temperature to kill bed bugs, and that's the temperature our Hartford County bed bug heat treatment reaches! All of your furniture, walls, and mattresses will be completely treated because heat penetrates thoroughly, killing all stages of bed bugs including nymphs and eggs, not just adults! With our Hartford County Bed Bug Heat Treatment Method, your Hartford County CT or any part of Rockland, Putnam and Westchester Counties, NY home will be treated in a single day. You can return to it immediately! There's no dangerous chemicals or residue; you'll return to your home completely worry free. There's no need to remove your personal belongings, and the best part is, they won't be damaged! BedBug Chasers uses heating technology which quickly turns your home into a superheated conventional oven. Our Bed Bug Heat Treatment system in Hartford County, CT uses clean 100% chemical free highly specialized electric heaters, which are a proven methodology that quickly and effectively will get rid of any infestation that may be in your home. Call us at (203)-930-1565 today! What Makes Us The BEST Bed Bug Heat Treatment Method in Hartford County CT? Our Hartford County CT Bed Bug Heat Treatment strategically places our BedBug Chase heaters and fans throughout your home to ensure a successful Bed Bug Heat Treatment. We monitor the temperatures in each individual room to ensure that your home, its contents and walls are heated to the necessary temperature to kill off unwanted bed bugs. In addition to killing bed bugs in Hartford County, our heat treatment method will also kill many other bug infestations you may have in your home. Once all the temperatures are captured in our software - we prepare a comprehensive report describing what our BedBug Chaser team came in contact with, the measures that were taken to extinguish what was encountered, including graphs which will identify the temperatures successfully achieved throughout your property for the bed bug heat treatment in Hartford County, Connecticut. Why Choose the Bed Bug Heat Treatment Solution in Hartford County, CT? Not all Hartford County bed bug heat treatments are as effective and efficient as ours. Other heating systems raise the temperature slowly which causes it to rise unevenly and allows bed bugs time to escape to cooler areas in your walls, basement or even inside your mattress or couch. Other treatments can also permanently damage if not destroy your belongings, some can even cause mold, and they don't exterminate 100% of bed bugs at that! Our Bed Bug Heat Treatment in Hartford County Connecticut penetrates every inch, nook and cranny of your home or business to the exact temperature required to kill bed bugs, and do it without damaging anything, never causing mold! It's completely effective, totally safe, there's no need to remove your belongings and upon your return, they'll be in perfect condition, and bed bug free! Propane Bed Bug Treatment in Hartford County, CT vs. the BedBug Chasers Dry Heat Method. If your house is treated unevenly, some areas may never reach the temperature that is necessary to killing the bed bugs while other areas could reach extremely high temperatures causing damage to your home. 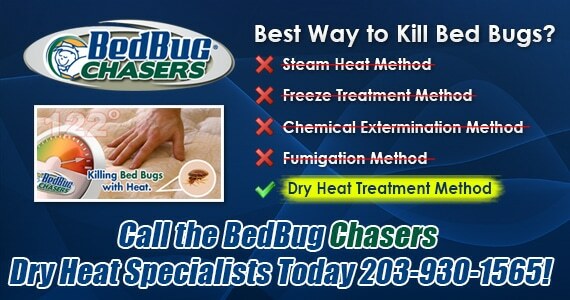 If you are searching for Bed Bug Heat Treatment in Hartford County, CT to get rid of your unwanted Bed Bugs you should call the BedBug Chasers! Our Bed Bug Heat treatment in Hartford County, Connecticut; it's not only effective but safe for your family, guarantees no mess, there's no toxic residue to be left behind, there's no moisture and no scuffs. We are the Hartford County Bed Bug treatment difference, we eliminate bed bugs and give you peace of mind! Call us at (203)-930-1565 today!